You could've visited any other consultant in the world, but you're here. We appreciate you! Sample of a website I've done recently (2017). We provide implementation services, which fall somewhere between a designer and developer. We can conceptualize and design a site for you based on your unique needs. We then use a hosting site (preferably Squarespace, Wordpress, or Wix), find and install a theme that suits your website goals (along with any desired plug-ins), customize it to your liking, and teach you to maintain and manage your site once it's finished. We also provide social media services; specifically establishment of a web presence, social media management, blog posting, customized marketing plans, etc. Lastly, we dabble in logo design. Feel free to ask for further examples of our work! Sample of a book that I co-wrote, edited, and self-published. Candace (owner of C. Nicole Consulting) is a reader and writer at heart. As a young adult, she immersed herself in writing poetry and blogging. 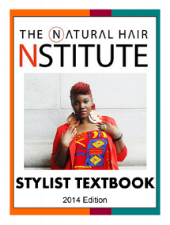 In her early 20s, she co-founded and managed a natural hair school for which she wrote the majority of the textbook material and published the textbook itself. That book (cover page shown above) remains one of the best examples of her writing, editing, and publishing abilities. Our services include editing and publishing of long works (e.g. educational works, fictional stories, etc.) as well as flyers, promotional materials, etc. Samples of virtual "sets", with pieces that I curated and styled. Always a fan of style, Candace has been coordinating outfits ever since she could dress herself. In college, she excelled in an Intro to Fashion Design course. Her participation on Polyvore has gained a bit of a loyal following, and has led her to virtual personal styling. These experiences have awakened Candace to the symbiotic art of personal styling: the stylist is able to be successful in following their passion, and the client walks away with the new-found confidence that comes from having looks tailored to their own body and personality. We're now pleased to offer personalized virtual styling services. In-person consults are also available for those within the Washington, DC Metro area.